[attachmentid=44818]Does anyone know something about the St Stanislas with black enamel in the arms of the cross (rather than red)? I don't know the reason for black and red versions of the important orders. I do know that there are black versions of this one and several others. Now I'm curious. The image that I sent of the black enamel St Stanislas is from a museum in Russia. 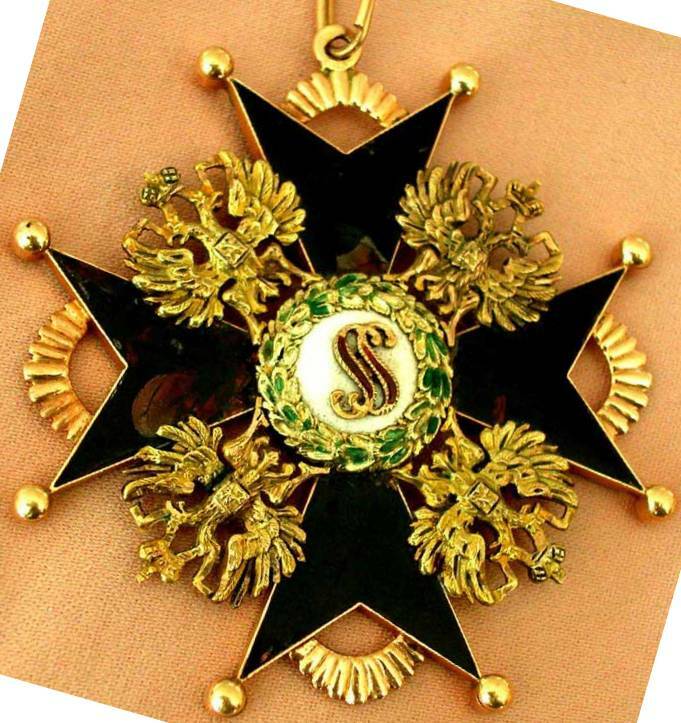 My ancestor, who was a colonel on the Russian General staff, was awarded a similar one, but without the crown on top. I have been told that the black enamelled version was in use between 1820 and 1850, but as I heard that only third hand, I am interested in anyone else's interpretation. I had earlier hears a story that the black enamelled versions were for recipients who were not members of the Russian orthodox Church, for example Muslims from the asiatic provinces, but I have never seen a word of confirmation of that opinion, and currently think that it is not true in the case of this St Stanislas. It was purely a fashion statement. At one time it was fashionable to do this to have something just a little more special than the next man. Kind of like a convex or screwback EK1, or an obscenely high spike on your pickelhaube. It told everyone that you demanded the best AND could afford it. The reason behind these black enameled crosses is unknown (a lot of theories though, like the mourning of the death of Czar Nicholas I etc. ), but like Daniel said, this eventually became purely a fashion-statement. These crosses are always privately made, unofficial pieces. The trend was in use around 1860-1880, and concerned orders of St. Alexander Nevsky, St. Vladimir, St. Anna and St. Stanislav. 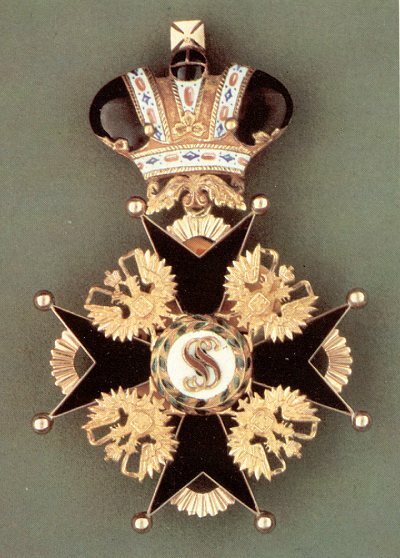 Regarding the awards to non-christians, they were the same as those awarded to christians, except that since 1844 the portraits (or the monograms, like in case of St. Stanislav) of saints or cross symbols were replaced with the state emblem, the imperial double-headed eagle. Are these rarer versions more desirable in the collecting community? Since my interests are in the areas of Imperial German and Soviet, I came across this thread quite by accident; but since my wife has a few Imperial Russian pieces, I have had a little experience in this area which I would like to draw upon regarding this subject. Basically, Pete A has it right in post #5, except that, as I understand it, the change took place roughly during the decade of the 1850?s. Right on target with regard to the non-Christian awards. Following is a piece from my wife?s collection. How are things in the North country this summer? I miss swimming in Loon Lake and Lake George. Thanks for the compliment. All goes well up here - days in the 80?s, nights in the 60?s and water temps just crossed the 70 mark. We just closed out the wettest June on record, so water levels in the lakes are very high. If you should ever decide to head back this way, drop me a PM and stop by for a beer. I miss ice fishing for smelt on Lake Champlain. I like to think cold thoughts like that when it hits 99 degrees here on the Prairie like it did today. Think coooool thoughts, I say! Many thanks for sharing the brilliant image of the black St Stanislas. I wonder if you have any idea of its date of manufacture, and any idea of its current market price, were I looking to buy one? Many reproductions have hit the market of black enamel orders. Originals were made pre-1850 and the enameling was almost like glass. Flat and hard. Very dark translucent. Looks solid black but under light it is translucent. Not like the enamel found on orders of the late 1800's or early 1900's. The fakes have enameling like you see today and are of a solid pastel black color. The color pigment is also very bright of todays color standards. This III class one I believe to be from the 1850s. 13 grams. 42 MM across. Many thanks for all that information over the years, and especially the images. Here is the image of my father's black St Stanislas given/awarded to him by General Pavlichenko on the wharf at Sevastopol just prior to embarkation for Constantinople in November 1920. It belonged personally to Pavlichenko, and seems from the discussion to have dated back to about 1850-70. It certainly closely resembles those in the other images. It was in its original cardboard box as shown. My father, who was a Polkovnik on the staff of General Skalon, went on to command the camp for Russian refugees at Tuzla on the Sea of Marmara. General Pavlichenko said to my father that he would get him a "proper" one later, meaning a current model with red enamel, but they never saw one another again. 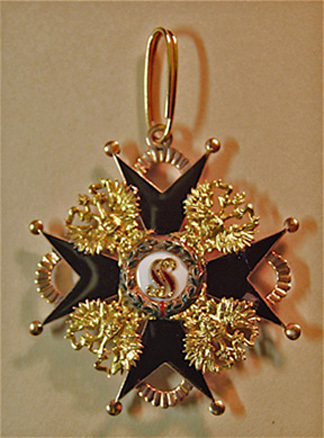 My father had previously been awarded the Order of St Ann and the Order of St Vladimir with crossed swords and bow. General Pavlichenko also conferred on father membership of the Don Cossack stanitsa of Shkurinskaya by way of a document which we still have today. some closeups without the ribbon attached, front and back. One of the pictures' angle reflects the lamp light or flash more than desired. Are you sure thay this is black enamels on your st Stas? It looks like dark red enamels on the last set of photos? I believe that on black enamels you can't see the "ribs" under the enamels no matter the angle of the light... I had a few and never saw the gold under the enamels. I have one miniature with datk red, looks like black, but it's not.